Increase speed, accuracy and throughput at your truck gates: our leading-edge OCR camera technology allows fast and accurate identification of trucks and containers. Reduce your damage claims: Camco’s OCR Portal generates high-resolution pictures for condition recording of trucks and trailers. Reduce operations time with Camco’s Rail OCR Solution, providing automated inspection, identification and inventory of rail cars and containers. 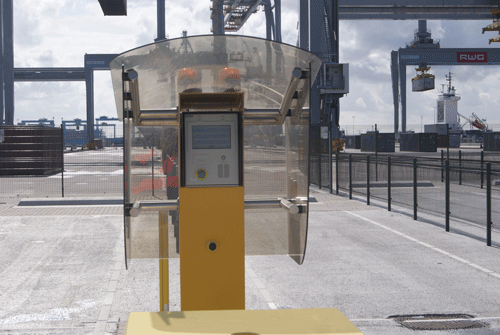 Measure the position of any container or container handling equipment on your terminal to improve operational efficiency. Camco’s PDS solutions are based on a combination of UWB distance ranging, DGPS and INS. Equip your ship-to-shore and gantry cranes with OCR technology to automatically register and identify containers during handling. Improve your gate efficiency using Camco’s kiosk systems, designed to optimize data entry and booking registration processes, and to reduce gate staff interventions. Improve your interchange processes by increasing efficiency and safety: LSTP or Grid Kiosks automate the identification process and enhance communication during the transfer process. Camco’s in-house developed software suite manages and steers complete gate processes and can be seamlessly integrated with your existing software systems. 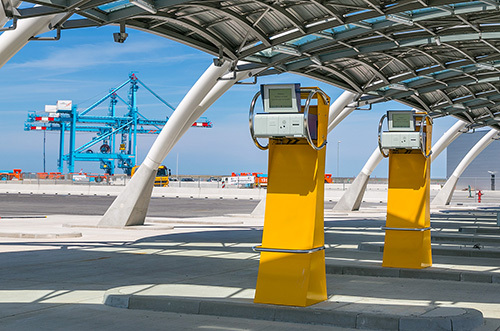 Speed up gate operations and reduce helpdesk interventions by using RFID cards that track and trace vehicles and people present on the terminal. RFID can also be used in access control systems to comply with ISPS. Optimize terminal access control: Camco’s accurate and swift LPR and ANPR systems allow you to control and track every one entering and leaving your terminal.